SArturo Gatti was born April 15, 1972 in Cassino Italy and raised in Montreal before moving to Jersey City when he was 19. A talented all-around athlete, Arturo played hockey and soccer as a boy in Canada and had his first boxing match at the age of 8. His quickness and punching skills came in handy against bullies, who often picked on him because he was undersized. After Arturo’s father died, when he was 15, he became serious about boxing as a way to make a living. Arturo had success in the amateur ranks in Canada and won some international bouts. In 1991, he moved to New Jersey to further home his skills. He was a popular figure in Jersey City, making many lifelong friends. Arturo’s goal was to make the 1992 Canadian Olympic team, but he chose to turn pro that year. He had his first fight on November 17, losing a split decision to King Solomon in Philadelphia. But within two years had ascended to the USBA Junior Lightweight championship. Arturo did not lose again until 1998, when he dropped consecutive bouts to Angel Manfredy, and twice to Ivan Robinson. During his remarkable six-year run he beat Tracy Patterson for the IBF Super Featherweight crown. He also signed a lucrative contract with HBO and became a favorite of fight fans around the world for his ability to recover early round problems and win fights in the final rounds. Arturo’s three losses came after joining the Lightweight ranks. 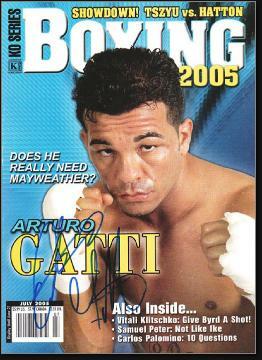 Arturo lost a 2001 meeting with Oscar de la Hoya, who later said he was the hardest puncher he’d ever faced. The following year, Arturo dropped a fight to Mickey Ward. Arturo won his next two fights, both against Ward in Atlantic City. He went on to capture the WBC Super Lightweight title in 2004, holding it for 11 months before losing to Floyd Mayweather Jr. in 2005. Arturo won the IBA Welterweight title in his next fight, but dropped his next to bouts before announcing his retirement. He was 40–9 for his career, with 31 knockouts. Arturo returned to Canada, where he managed his real estate investments. In the summer of 2009, Arturo and his wife, Amanda, traveled to Brazil fir her sister’s wedding. On July 11, he was found dead in his hotel room. Amanda was arrested and charged with murder. The coroner later ruled his death a suicide. Controversy still surrounds the details of his death. In 2012, Arturo was inducted posthumously into the International Boxing Hall of Fame.